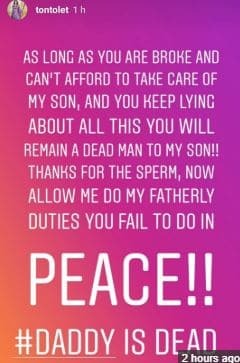 Nollywood actress and mother of one, Tonto Dikeh is currently launching attacks on her ex-husband Olakunle Churchill on social media as we speak. The actress started off by stating that her son’s daddy is dead because he’s unable to care for their child due to him being broke. I know not what the man did but this is going too far.